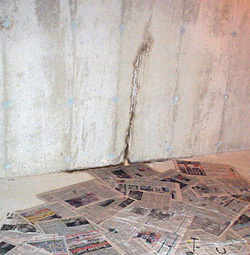 Q: My concrete slab foundation keeps cracking, even after the cracks have been repaired. How can this problem be fixed permanently? A: A cosmetic solution (patching cracks with mortar) isn’t adequate if cracks keep reappearing. The soil beneath the slab may not have sufficient bearing capacity for the weight of the slab and the structure it supports. Alternatively, poor drainage around the slab may have washed soil away beneath a section of the slab. Expansive soil is another possible cause. A skilled foundation repair specialist will be able to evaluate the foundation, test the soil, and determine what repairs are needed to stabilize the foundation. The original mid-span support in this crawl space— brick pillars beneath a wood beam — made floor joists springy and uneven.Adjustable steel posts on new concrete footings solved the problem. Q: What are the main problems that can occur with a post-and-beam foundation? A: This type of foundation is sometimes called “pier-and-beam.” Support comes from a series of foundation posts (or foundation piers) that extend from footings in the ground to horizontal beams that in turn support floor joists. A post can fail because its footing shifts or settles; because the post has rotted, or because the post isn’t anchored securely to the beam or the footing. In most cases, repairs can usually be made to individual posts without affecting other parts of the foundation. 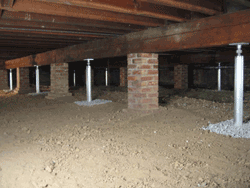 When a foundation is sinking because of soil with low weight-bearing capacity, steel piers can connect the foundation to bedrock or stable soil at greater depth. Q: What can be done to fix sinking foundations? A: Foundation sinking, also known as foundation settling, can have several causes. The most common problem with this type of foundation is a failure of one or more posts. This damage can occur because the soil supporting the foundation doesn’t have sufficient bearing capacity, or because drainage problems have washed away some of the soil beneath the foundation. When a foundation sinks because the soil has insufficient bearing capacity steel piers are driven down until they reach bedrock or solid bearing soil. Brackets attached to the piers stabilize the foundation or (in some cases) can be jacked up to raise the settled foundation. Q: What kinds of repairs are involved in foundation restoration? A: To be effective, foundation restoration work must not just correct the symptom – like cracked foundation walls, for example. The cause of the problem must also be determined and corrected. If foundation walls have cracked and/or been pushed inward, it’s likely that poor drainage around the foundation is causing the soil to expand, cracking the foundation wall and pushing it inward. In addition to installing wall anchors that stabilize damaged wall sections, a foundation repair specialist may also need to improve drainage around the foundation so that excess water does not accumulate there. Other common repairs include stabilizing settled or shifted floors and slabs with piers, and replacing damaged or unstable post-and-beam supports with new footings, posts, and beams. If a concrete crack opens up again after being patched with mortar, it’s a sure sign that more serious structural issues need to be addressed. Q: Why do my doors stick? A: Doors can stick for two reasons: moisture-induced expansion and foundation movement. If the cause is foundation shifting or settling, doors and nearby windows will stick or be difficult to operate all year round, not just during wet weather. Also, there may be other telltale signs, like cracks in wallboard at the top corners of window and door openings. Q: What causes buckling concrete slab floors? A: Expansive soil beneath and around the foundation is a common cause of buckling concrete floors. Soil characteristics can vary greatly. Soils that drain well are generally more stable that clay-rich soils, which tend to shrink when dry and expand when wet. If a NY foundation repair contractor determines that expansive soil is causing floors to buckle, the first repair task will be to use different drainage techniques so that less moisture is getting into the soil. Once this is done, other techniques like piering can be used to stabilize the floor. Q: How difficult is it to repair sagging floors? A: The difficulty of the repair depends on where and why a floor section is sagging. Floors sometimes sag toward the center of the house because the post-and-beam framework that provides mid-span support has settled, shifted or deteriorated. It’s a fairly straightforward repair to jack up the sagging floor joists and rebuild the post-and-beam system to keep floors level. If floors are sagging because a perimeter foundation wall has shifted or settled, this damaged section will need to be stabilized before the floor can be leveled. Q: How can retaining walls be repaired if they crack and tilt? A: It’s often necessary to remove some of the soil behind the damaged wall section and install anchors that will hold the wall plumb. If the wall wasn’t properly reinforced, the damaged section may need to be rebuilt. It’s also possible that drainage problems may need to be corrected to alleviate the pressure caused by wet soil behind the wall. But if the cracking and displacement are minor, a Franks Basement Systems foundation repair specialist may be able to use helical anchors to stabilize the wall, eliminating the need for extensive reconstruction. Q: What are insulated concrete forms? A: Unlike conventional concrete forms, which are removed after a concrete wall is poured and has had time to cure, insulated concrete forms (ICFs) stay in place, becoming a permanent part of the foundation wall. An ICF wall is made from interlocking sections of rigid foam that are filled with poured concrete. To build an ICF foundation, a complete foam form wall is assembled atop a footing. Steel reinforcement is added as ICF form sections are joined together. When the foam wall is fully assembled, it can be filled with poured concrete. The main advantage of an ICF foundation is that it offers better energy performance because of the foam’s insulation value.